Emergency Situations: If you get lost or injured; keep calm and stay put. If you have cell service, call the DEC Forest Ranger Emergency Dispatch, 518-891-0235. Winter is a great time to get outdoors. The cold, crisp air is exhilarating. The scenery is spectacular, even more wondrous than the summer. There are no biting insects and fewer people on the trails. The quiet and solitude is remarkable and most enjoyable. More information on winter hiking safety and what to pack. Weather forecasts and conditions can and do change quickly. Check the current National Weather Service Forecast, and be prepared for the forecasted conditions or change your plans. Inform someone of your travel plans: Let them know where you are going, your planned route, when you plan to return, and emergency numbers to call if you do not return at the scheduled time. Wintry weather conditions: Late fall into early winter brings vastly changing weather conditions in the mountains. Warmer temperatures and possible rain at trailheads will quickly turn to freezing temperatures, hail, or snow as you gain elevation. Plan for below freezing wind chills and heavier winds on exposed areas and summits. Bring warm, wind protectant layers to help prevent hypothermia. Trails are very muddy in lower elevations. Always walk through the mud to avoid damage and erosion to trails and vegetation. Fallen wet leaves have made trails very slippery. Use caution on steeper slopes and exposed areas. Higher elevations in the High Peaks and exposed summits are experiencing early winter snow and ice. Bring traction devices on all high peaks. Properly prepare to better ensure a safe and enjoyable recreation experience. Stop where you are. Keep calm and assess your situation. Try to determine your location. Look for recognizable landmarks, and listen for vehicles on nearby roads. If you are sure you can get yourself out of the woods using a map and compass, do so. Otherwise, stay put. If you have cell service, call the DEC Dispatch (see above). The dispatcher will ask questions to collect information needed to help searchers locate you quickly. If you don't have cell service, move to a location close by where you are visible to searchers on the ground or in the air. If you have something brightly colored, wear it or place it in a conspicuous location. Clear an area of snow to build a campfire for heat, light and comfort. A fire will help searchers locate you. Using snow or items from your pack, build a shelter that will serve as a "cocoon" to keep you warm and sheltered from the weather. You can also use dead branches, conifer boughs and leaf litter to insulate the shelter. Water- Store your water upside down in your pack. Wrap bottles in wool socks, clothing, or use insulated carriers. Bladders will usually not freeze deep in your pack, however, the tubing will. Blow water back into the bladder after every drink. Use a hydration bladder tube insulator to keep water from freezing. Food- Store small snacks close to your body. Choose food that is less likely to freeze like nuts, granola, etc. and break it into small pieces. You can also wrap your food in newspaper or extra clothing to help insulate it within your pack. It is beneficial on very cold hikes to pack extra weight in calories. Bring a thermos of soup, coffee, hot chocolate etc. for a quick warm up. A cookstove, cookware and non-perishable food like soup, oatmeal, or freeze-dried meals will help pack more calories and offer a warm meal on long hikes. A few things to include are: a pocket knife, duct tape to patch ripped jackets or broken poles, a headlamp for unexpected trips out in the dark or overnight stays, space blanket, emergency whistle, first aid kit, fire making tools, extra layers and socks, and extra snacks. Late Fall/Early Winter Weather: Night time temperatures may drop below freezing – especially in the higher elevations – and days continue to grow shorter. The sun sets earlier – carry a flashlight or headlamp. Dress in layers of non-cotton, wicking fabric, and pack extra clothing. Those hiking to the higher summits should also pack a winter hat, gloves, and traction devices. Daylight Savings Time: Clocks will be set back an hour overnight Saturday. Sunset on Sunday will come an hour earlier than on Saturday – plan accordingly. Hunting Seasons: All big game, small game and waterfowl hunting seasons are open, and others will open soon. Hikers should be aware that they may meet hunters bearing firearms or archery equipment while hiking on trails. Please recognize that these are fellow outdoor recreationists with the legal right to participate in these activities on forest preserve and conservation easement lands. Hunting accidents involving non-hunters are extremely rare. Hikers can wear bright colors if it makes them feel safer. Watch for Moose: Motorists should be aware that moose are rutting this time of year. Moose will be wandering around looking for mates and walking into roads without paying attention to vehicles. Take precautions to avoid colliding with moose. Fire Danger Rating: Low. Check the current fire danger map. DEC forest rangers have responded to several wildland fires started by unattended or improperly extinguished campfires. Be safe with campfires. Wet, icy, and snow-covered leaves are slippery, especially on steep slopes. High elevation trails may be covered in ice and snow on summits and in other exposed areas. Carry traction devices (trail crampons) on all high elevation hikes. Middle and low elevation trails are wet and muddy, especially along water bodies, in low areas, and in drainages. 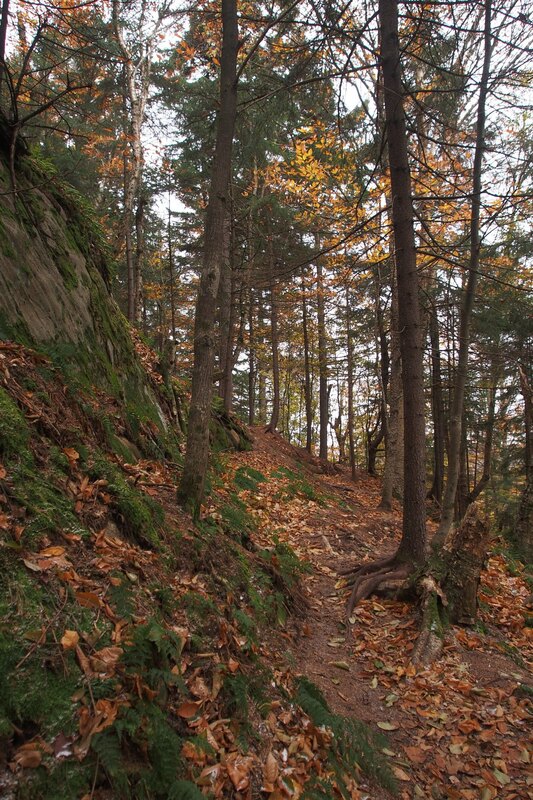 Avoid damaging hiking trails, trail side vegetation and habitats. Wear water-resistant hiking boots and let them get muddy. Stay in the center of trails and walk through mud and water. Stream Crossings: Use caution around steep, shallow, rocky streams and rivers. These are considered “flashy”, meaning water levels can rise quickly after heavy rainfall. Water levels will also drop quickly after the rains have stopped. Mountain Summits: Temperatures will be much colder, winds will be stronger, and higher elevations may have wintry weather and ice. Check the National Weather Service Mountain Point Forecasts for selected summits. Bear Canisters: DEC requires overnight users in the Eastern High Peaks Wilderness to use bear-resistant canisters through November 30. Water Temperatures: Water temperatures continue to get colder. Paddlers and boaters should wear a personal flotation device (PFD, aka life jacket). People immersed in cold waters can lose the ability to think clearly and move quickly after only a short time in the water. Anglers fishing from shore or wading should also wear a PFD. Water Levels: Due to recent rains water levels are in the average range. Forecasted rains may raise levels to above average or high. See the USGS Current Water Data for New York for stream flow of selected waters. Electric bicycles: Electric bicycles (E-bikes) of any class are not allowed on trails or roadways where public motorized access is prohibited. Sable Highlands Conservation Easement Tract: The gate on Barnes Pond Road is open for the big game hunting season. The 3.9-mile seasonal access road is off the True Brook Road and provides access for hunters and others to six campsites along the road and the interior of the 3,761 acre Barnes Pond Public Use Area. 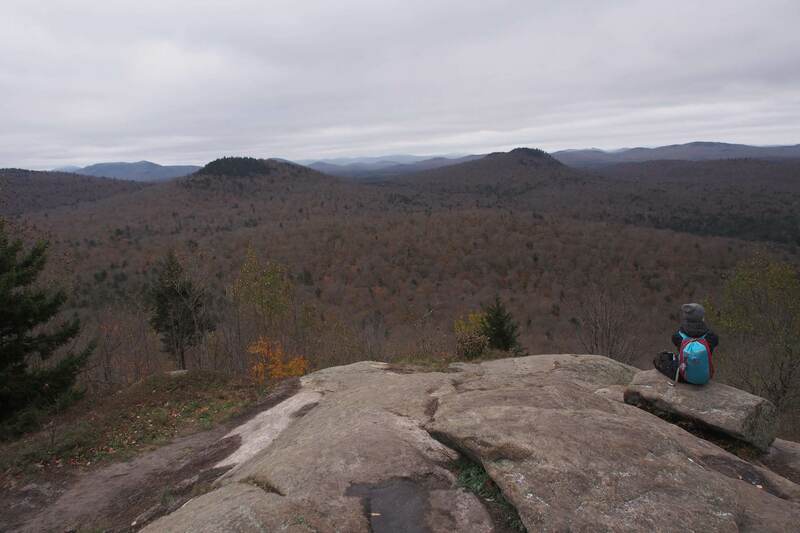 Speculator Tree Farm Conservation Easement Tract: The southern half of Cave Hill Road will be closed to the public for the remainder of the big game hunting season. High Peaks Wilderness: DEC, with the assistance of NY State Police Aviation Unit, is airlifting white bags of stone to the ledges near the summit of Mt. Van Hoevenberg. The stone will be used to build up retaining walls and harden trails to protect the soil and vegetation along the exposed ledges from wind, rain and hikers. Some work will be completed this November 2018 and the remaining work will be completed in the spring. Please take care around the flight bags and stone piles. The temporary visual inconvenience of the flight bags will be offset by the protection their contents will provide to the natural resources on the summit long into the future. Boreas Ponds/Vanderwhacker Mountain Wild Forest: Work on the roads and parking lots beyond the Fly Pond Gate is done for the year. Gulf Brook Road is once again open for public motor vehicle use to the Fly Pond Gate seven days a week until it closes for the winter. Work beyond the Fly Pond Gate will be completed in the spring. The 2,265-ft Coney Mountain is part of the Horseshoe Wild Forest. 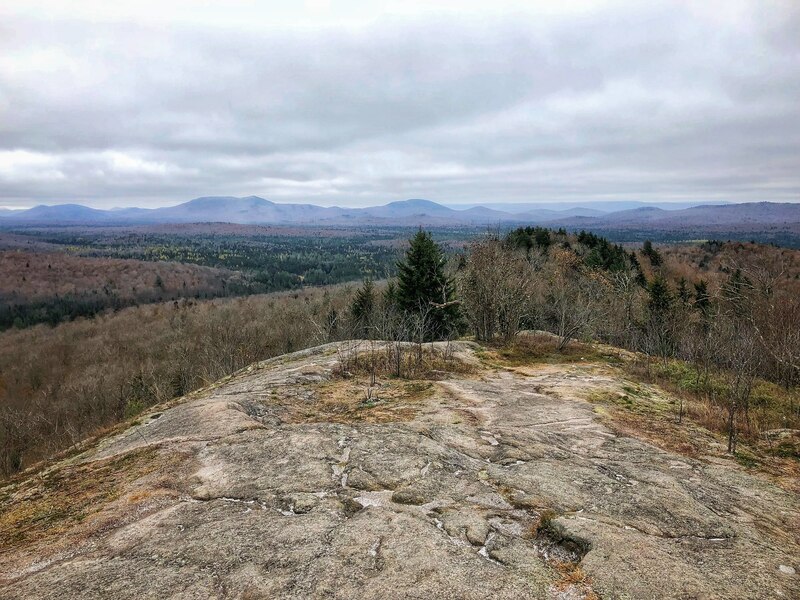 Located just outside of Tupper Lake, this 1.1-mile one-way hike is an excellent, family-friendly trip that boasts stunning 260-degree views on its bare summit. The trail itself is rocky but well-maintained and utilizes switchbacks to make the 523-ft elevation gain feel mild at most points. Trailhead: From the intersection of Route 3 and Route 30 in the Village of Tupper Lake, follow Route 30 toward Long Lake. Follow here for just under 12-miles to trailhead on the left. A state DEC sign marks the location. Read How Climate Change Affects New York's Species in DEC's October issue of the Conservationist magazine. Want to read more stories like this, subscribe now!